Today we launch our revamped Political TV Ad Archive website, tracking broadcast airings of presidential and senate ads in key states in the general elections — all the way up through Election Day. Meanwhile, our site continues to offer downloadable data about 2016 election TV ad airings; embeddable, shareable political ad videos; and quality fact and source checking from our national journalism partners. We also archive some ads in markets we are not tracking for airings, as well as some that appear solely on social media. We count ad airings in key markets using the Duplitron 5000, an open source creation that uses audio fingerprinting to create a unique signature for an ad, and then counts how many times it appears in a stream of television from a particular channel. For the general elections, we are tracking major broadcast stations in 12 TV markets, ten of which are in swing states, and five of which feature key Senate races currently rated as “tossups” by The Cook Political Report. Below are the markets, along with current Senate race ratings from The Cook Political Report. For more details on which channels we are tracking in each location, please visit our data page. In addition to these markets, we track ad airings in the Washington, DC/Hagerstown, MD market, where political interests often air issue ads and other ads to catch the interest of the politicians and officials in the nation’s capital. Our San Francisco TV recording captures national cable channels, such as Fox and MSNBC, unlike our local recordings, which concentrate on major broadcast airings. Political TV ad airings in this location are often indicators that a cable TV news show has done a story about that particular ad. The revamped website also contains new viewer-friendly features to make the underlying information more intuitive to find and easy to access. An interactive map, allowing the user to hone in on airings in particular TV broadcast markets. The viewer can toggle between seeing ads before July 1, after, or seeing all ad airings archived in the 2016 elections to date. Click on one of the circles, and see ads aired in that particular TV broadcast market. Fact and source checked ads are featured on the home page — allowing the viewer to click through and see which political ads have been fact or source checked by our journalism partners: the Center for Public Integrity, the Center for Responsive Politics, FactCheck.org, PolitiFact, and The Washington Post’s Fact Checker. Click on an individual ad, and see our partners’ reporting on the ad. Our improved advanced search makes it easier to find the ads you are looking for. Search by ad sponsor, candidate targeted, TV program, and much more. 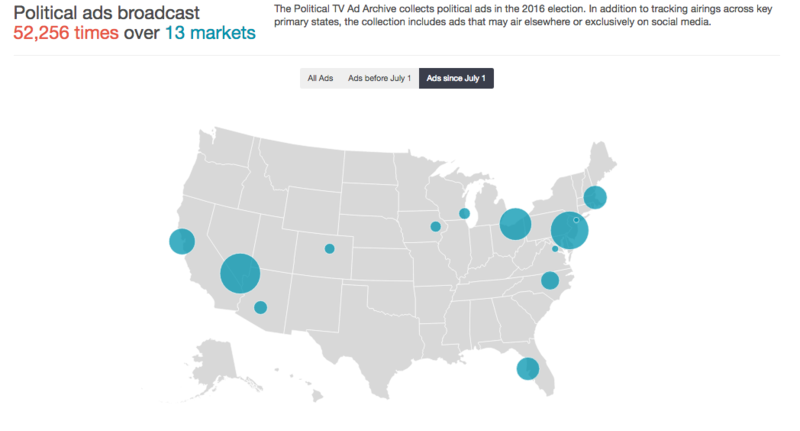 The Political TV Ad Archive launched in January 2016 and tracked ads in 23 TV broadcast markets in key markets during the primary season. Journalists from The Washington Post to Vox to Time Magazine have used the resource to help inform reporting on the 2016 elections. Our national partners on this project are: American Press Institute, Center for Public Integrity, Center for Responsive Politics, Duke Reporters’ Lab, Factcheck.org, PolitiFact, Sunlight Foundation, and The Washington Post’s Fact Checker. Fact checks and journalism about ad sources are embedded on political ad pages, such as this one. The first phase of the Political TV Ad Archive, covering key 2016 primary elections, was funded by a $200,000 grant from the Knight News Challenge, an initiative of the John S. and James L. Knight Foundation. The Challenge was a collaboration joined by the Rita Allen Foundation, the Democracy Fund, and the Hewlett Foundation. The Democracy Fund also granted $49, 634 to support joint trainings of journalists in key primary states in partnership with the American Press Institute. Additional support came from personal donations by Christopher Buck ($25,000) and Craig Newmark ($20,000). The January 2016 launch event was co-sponsored by the National Press Club Journalism Institute. 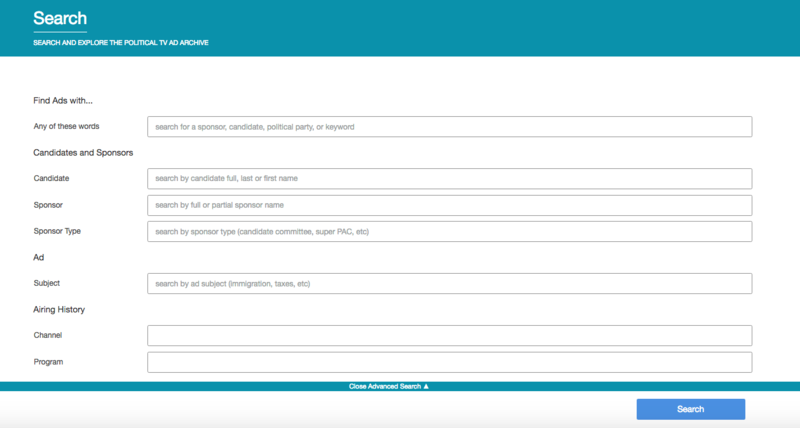 The Rita Allen Foundation is supporting the Political TV Ad Archive’s monitoring of political ads in the general elections with a $110,000 grant. The foundation was part of a consortium that supporting the project’s work during the primaries.